Illustration by Joshua Seong. © Verywell, 2017. Do you use biking to lose weight? Bicycling is a great leisure activity, but if you are bike riding for weight loss you need to structure your workout differently than you would if you are just doing a casual ride with a friend. Use the tips below to buy the best bike for weight loss and set up your workout properly, so that you can start seeing results. You can also use a calories burned while exercising calculator to estimate your burn. How Far Should I Ride a Bike for Weight Loss? If you are cycling to lose weight, duration (the time you spend biking) matters more than the actual distance you travel. That means that you don't necessarily have to ride the entire Tour de France course to shed a few pounds. Relieved? Good. But don't put away the odometer. 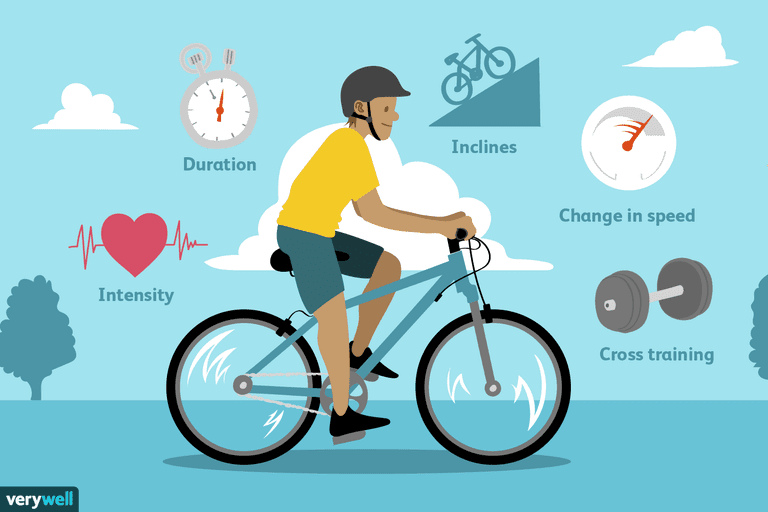 When you are new to exercise, you can start your biking workout program with a simple test. Use your odometer (or a GPS watch or smartphone app) to see how far you travel when you bike for 30 minutes. Jot down the number in your workout journal and set a goal to decrease the amount of time it takes you to ride that same distance and route. As your fitness level improves you'll be able to log more miles in less time and you'll burn more calories in the process. As you get comfortable spending more time in the saddle, schedule longer rides during the week. If you do three cycling workouts each week, complete one short ride (30 minutes), make one ride a moderate duration (45 minutes), and set a goal to ride one long tour (60 to 120 minutes) each week. How Fast Should I Cycle to Lose Weight? If weight loss is your primary goal, exercise intensity matters more than speed. A higher-intensity ride will burn more calories than a lower-intensity ride. The type of bike you ride and the trail you choose will affect both your intensity (how hard you work) and your speed (how fast you travel). For example, if you are riding a heavy mountain bike on muddy, off-road trails at 12 miles per hour, you'll probably have to work very hard. But if you are on a road bike pedaling down a hill, you can reach that pace with almost no effort at all. Your best bet? Learn to use a heart rate monitor. The device provides an accurate measurement of how hard you are working. Aim to work at 70 to 75 percent of your maximum heart rate for most rides. If you don't want to invest in a monitor, used the perceived exertion scale instead. On a scale of 1 to 10 (with 10 being maximum exertion), you should feel like you are working at a level 7. You should be breathing deeply, but not exhausted or out of breath. Where Should I Go Biking to Lose Weight? The course you choose may have the biggest impact on the number of calories you burn because it will affect both duration and intensity. For best results, you want to choose a course that allows you to pedal consistently without taking too many breaks at stoplights or intersections. These short breaks cause your heart rate to drop, take up too much workout time, and decrease the calorie-burning potential of your ride. Many cities have dedicated continuous bike trails. Especially when you are first starting out, opt for these safe routes rather than riding on the road. If you don't have access to a bike path, it may be worth your time to drive to a location where a long stretch of quiet road is available. The best bike to help you lose weight is the one that you will ride on a regular basis. It's essential that you try several styles and find the one that fits your body. Some bike riders prefer a road bike with thin tires and a sleeker frame. A road bike is lighter and requires less effort when you ride fast. Road bikes are best for paved surfaces and long, uninterrupted stretches of road. But some riders don't feel steady on this style of bike. A road bike requires that you lean slightly forward while you ride. If you have back issues or concerns about safety, this may not be the bike for you. You may prefer the comfort and ease of a cruiser or a mountain bike that has heavy, thick tires. These bikes usually offer some suspension and cushioning to make the ride more comfortable. And you are usually able to maintain a more upright posture when you ride this bike style. Also, the thicker tires provide more stability so riders often feel safer on these bikes, especially if they are new to cycling. If you are new to cycling or if you plan to use your bike for an extended daily commute, an electric bike (also called an e-bike) might be the perfect option for you. Brands like Trek make cycles that you ride like a standard bike, but you get a boost of assistance when you need it. For example, Trek's Super Commuter provides a comfortable upright ride with the option to use eight different speeds. If you hit a hill or need a break from strenuous pedaling, you can engage the Bosch pedal-assist system that helps you sustain speeds of up to 27 miles per hour (45 km/h). Some exercisers use recumbent bikes at the gym, preferring the reclined body position to an upright position that is typical in standard cycles. However, some riders choose a recumbent bike for their outdoor ride. These bikes allow you to sit closer to the ground, generally have a wider saddle, and are generally better able to accommodate riders with back problems. However, because of their low profile, these bikes can be more difficult (and less safe) to ride in traffic. So consider where you plan to ride before investing in this style of bicycle. You can find the best bike for your body and cycling style by shopping at a dedicated bike shop. The salespeople at these stores are trained to measure you for a proper fit and to provide recommendations based on your budget and riding style. They will measure your body and make suggestions or adjustments not only to the seat height, but also to handlebar height and width, top tube length, and saddle size so that you ride in the most comfortable position. Now that you've got a good bike and you've figured out how to structure your cycling workout, you'll want to get a few pieces of equipment to keep you comfortable and safe on your rides. Helmet. Buy it and wear it—always. Visit your local bike shop to be properly fitted. A cycling expert will show you how to wear your helmet so that you are protected in the event of a crash. Identification. This is another item that you hope you never need to use. In the unfortunate event of an accident, having an ID such as a driver's license or a Road ID bracelet will help responders do their job. Cellphone. As your fitness level increases, you'll find yourself traveling further from home. If your bike breaks down or the weather becomes dangerous, a cell phone will allow you to call for help. Plus, you can take advantage of useful cycling apps. Water bottle. An effective cycling workout will make you thirsty. Keep your water bottle full and remember to take sips along the way. Glasses. A good pair of cycling glasses will protect your eyes from flying debris like rocks, glass, or bugs. Get a pair with a rubber nose piece so they don't slide down your face when you sweat. Cycling shorts. Some cyclists prefer to wear shorts, capris, or leggings designed specifically for riding a bike. The shorts are designed with a chamois or pad that helps buffer friction between your body and the saddle. Most shorts also have waistband that is higher in the back and lower in the front to make your forward-tilted riding position more comfortable. Pair the shorts with a cycling-specific top to streamline your riding position. Saddle pack. This small pack attaches to your seat post and zips closed to hold your cell phone, your identification, and other essentials. Heart rate monitor. Measure your intensity with this high tech tool. Many activity monitors also provide an exercise heart rate to help you track your workout effort. Bike computer. A bike computer attaches to your handlebars and can measure speed, distance, pace, cadence, and many more features. It is not essential, but it's fun to have. Trainer for indoors. If you are serious about biking for weight loss, an indoor bike trainer is a handy tool. A trainer is usually a foldable contraption that allows you to ride your outdoor bike when you are indoors. It's great for rainy or cold days. Cycling shoes. Cycling-specific shoes are not necessary for weight loss workouts, but they can make your ride more comfortable. Avid cyclists wear shoes that clip into the pedals. The clips are not necessary, but you may find that a stiff shoe (cycling or otherwise) works better on your workout. The stiffness helps to transfer the pressure from the pedal to your entire foot, making your pedal stroke more efficient and comfortable. Keep these safety tips and workouts in mind as you prepare for your rides. Add hills. Build strength in your lower body, increase your aerobic capacity, and boost your calorie-burning potential by adding some hills to your route. You can even find one large incline and ride the hill several times as a single workout session. Add speed intervals. Once you establish a regular riding routine, begin to challenge yourself with speed. On flat stretches of road, add 1 to 3 miles per hour to your speed for several minutes. Follow that interval by a shorter rest period and then repeat the cycle three to five times. Cross train. Biking for weight loss is a great workout, but if you combine cycling with types of workouts you'll lose weight faster. On your non-cycling days, do a simple strength training workout at home, or walk to burn calories. Leave the earbuds at home. Never listen to music or bike with headphones in your ears, unless you are indoors on your trainer. Even if you are on a protected bike path, it is important to be able to see and hear everything around you. Don't ride and talk or text. Leave your cell phone packed away for emergencies. Biking and talking or texting can be just as dangerous as doing it while you are driving. Be mindful of the weather. Biking is weather-dependent. If your speed decreases significantly one day, it might only be due to high winds or heat. When you evaluate your workouts, look for trends rather comparing single days to each other. Biking for weight loss is a great way to burn calories, reduce stress, and enjoy the outdoors. Invest in safety equipment and the best bike for your body to keep your rides safe and enjoyable.